In Tyre, the city’s past is very much present. A fisherman in shallow waters stands near massive stone columns that are only partially covered by the Mediterranean. In shallower waters, a man who appears to be snorkeling startles upon approach, as it becomes clear he is actually sifting for small treasures.Above the water rises a road bordered by stone columns. There are fragments of mosaic on the road, and vegetation grows freely within Roman baths and an amphitheater. A few tourists are reading from a guidebook before entering the site. Tyre’s heritage isn’t just known by locals, as the presence of foreign tourists suggests. It is, in fact, a UNESCO World Heritage Site. But recently, reports have emerged that the ancient sites of the city once visited by Herodotus are in danger due to, among other factors, a lack of conservation. It’s been said UNESCO is considering revoking the city’s valued status. While these accounts contain kernels of truth, they have largely ignored the fact that Tyre is in the midst of a major conservation project. As to the question of city’s UNESCO status, it seems to have largely stemmed from bureaucratic error. Dbouk says he heard about the potential change in status through statements made by Maha al-Khalil Chalabi, of the International Association to Save Tyre. But it all seems to have started with two recent decisions issued by the UNESCO World Heritage Committee. In advance of a meeting this June, the committee issued a set of draft decisions. The draft about Tyre made the city’s conservation situation out to be dire. It expressed a variety of concerns, including major and often illegal urban development and insufficient maintenance of sites. These concerns were based on past reports, as the draft said Lebanon had not submitted a “state of conservation report” as is requested by all states involved in the World Heritage scheme. 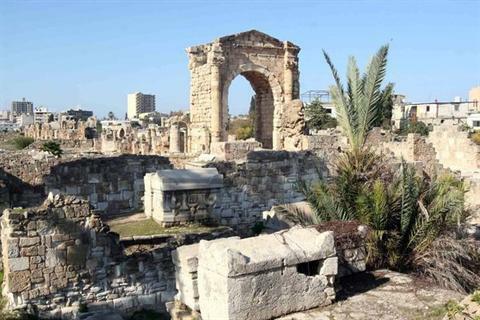 The Culture Ministry controls the archaeological sites in Tyre, and according to sources there who are familiar with the situation, Lebanon did in fact submit a report on current works, but it was sent to the wrong forwarding party. Once they realized the error, the officials say they rushed a new report to UNESCO in advance of the June meeting. The sources say they are in communication with UNESCO officials, will submit the requested update, and have invited UNESCO experts to visit Tyre on Oct. 2. All of this doesn’t mean Tyre’s heritage is not in danger. At the archaeological site in Bass, which includes numerous sarcophagi and a massive sandstone arch said to be built during the reign of Emperor Hadrian in the second century A.D., the heads of stone figures carved on some tombs have been chipped off by grave robbers. Empty bottles mix with bones inside some graves. Outdated restorations that used iron bars as reinforcements are rusty and expanding in the structures they are meant to hold up. Illegal buildings rise out of the neighboring Bass Palestinian refugee camp because there is no space for the population to grow, Dbouk says, and trash from the new buildings is finding its way into the archaeological site. But workers can be seen building a wall to separate the Bass site from the camp. They are part of a major conservation project that is under way in Tyre, an effort that complicates the UNESCO debate. The scheme is called the Cultural Heritage and Urban Development Project. It is currently focusing on the city’s old port, but also deals with other sites around the city. Funded by the French Development Agency, the Italian government, the World Bank, and the Lebanese government, CHUD projects are notable for their connection to UNESCO – they only exist in Lebanese areas marked as UNESCO World Heritage Sites. Maha al-Khalil Chalabi, of the International Association to Save Tyre, is a critic of the CHUD scheme. In a statement, she called the port project “chaotic,” and said that a planned new building “will be built on an illegal site and conflicts with the architecture of Tyre’s maritime façade … the development threatens to put Tyre … on the list of endangered cultural heritage. For his part, Dbouk believes talk of removing Tyre from its list of heritage, in addition to taking “millions of dollars” of funding out of the CHUD project, isn’t helping the situation of a city that needs more assistance.